A sweet, romantic tale that exceeded my expectations. Finally giving in to all the recommendations to read a Colleen Hoover book from friends and strangers alike, I was surprised to find that November 9 was not at all what I was anticipating. Somewhere along the way I had decided Colleen Hoover’s books were ‘romance’ and therefore not something I would enjoy – the clichés of the romance genre are not my cup of tea. But I have been happily proven wrong, and enjoyed November 9 enough to finish it in a single evening. November 9 follows the lives of Fallon, an aspiring actress whose life is marred by a tragic accident, and Ben, an aspiring writer with a mysterious past. A chance meeting on the 9th of November leads to them agreeing to see each other on the same day, and only that day, each year for 5 years. We all know from the outset that it’s going to be a love story, but that doesn’t in any way detract from the sweetness with which it is executed. There are twists and turns, and no one is quite what they seem. Given the story is spaced over the course of 6 (or 7 really) Novembers with no additional days of insight into the characters’ lives, it makes for interesting reading. My favourite thing about this book was that it is unabashedly a love story. Colleen Hoover does not pretend that this is anything but a story about love and heartbreak, and finding ourselves. I really enjoyed the self-discovery element of the story. I think, despite some questionable (but justified) behaviour of a few characters, the messages of this book are really positive affirmations of the importance of being your own person and not allowing family or partners to dictate your happiness. To me there was a strong theme that it’s ok to love people, to rely on them and draw strength from them, but you need to be able to make decisions for yourself and your own happiness, even if those decisions are different to the ones others expect of you. I read this book in a single evening, so the writing style was obviously compelling and easy to read. That said I found some of the characterization a little bit off. In particular some friends and family members of the two protagonists felt very one dimensional, as though they existed solely to move the narrative threads forward conveniently. I also found that Ben’s voice in his chapters was not as strong or distinctive as I would have liked. Given the information revealed later in the book it makes sense that not all of his motivations and feelings are on display early on, but it does make the suspension of disbelief harder as the book progresses. Fans of Colleen Hoover will surely love this book, and as a ‘CoHo’ newbie I certainly found this an enjoyable read. If you are looking for a love story that will surprise you and pull on your heart strings but isn’t too strongly explicit or too dark in its themes (though there is mention of suicide) then November 9 might just be for you. 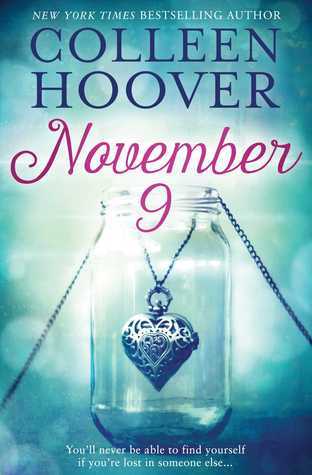 I will definitely be looking out for other novels by Hoover when I am in the mood for a contemporary romance.